What are the Most Commonly Strained Muscles? Lower back muscles are commonly strained. Episodes of muscle stiffness and strain may occur after prolonged physical inactivity. Hamstring muscle tears and strains are common sports injuries that can be slow to heal. Any muscle of the body can become strained when placed under undue stress or twisted in such a way that the muscles cannot reasonably accommodate the movement. Some of the most commonly strained muscles are leg muscles such as the thigh muscles, hamstrings, and calves. These are commonly strained muscles because they are often used in situations that require movement of the entire body, and these muscles are responsible for absorbing shock during normal walking and running. 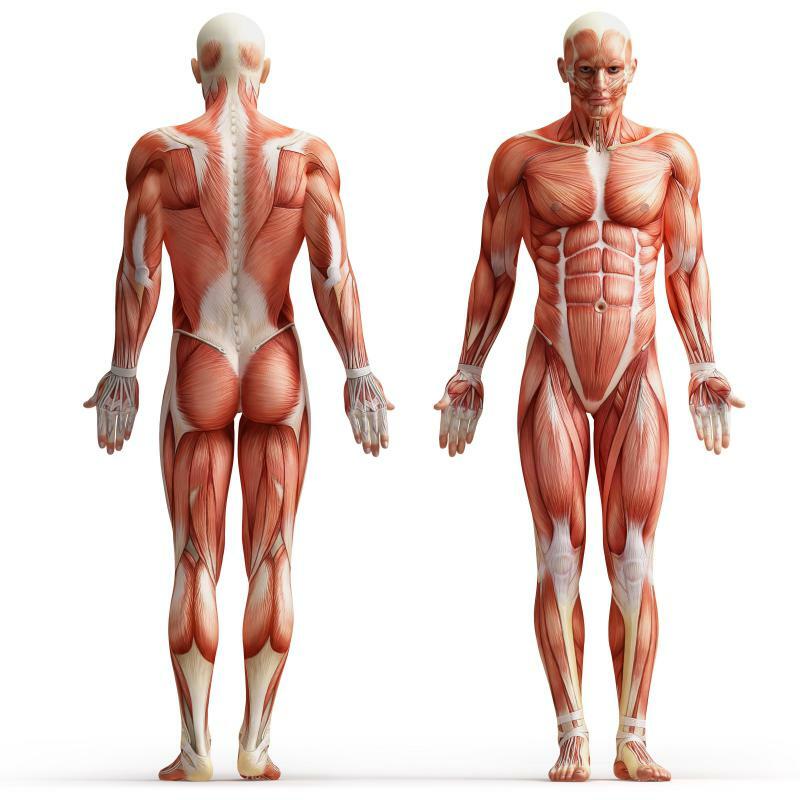 Other commonly strained muscles include the groin and lower back, and these muscles are particularly important to take note of because they are partly responsible for supporting the spine. Strained muscles occur when the tiny fibers that make up the muscle begin to tear due to overextension or unnatural movements. In most cases, the strain can heal on its own when a person employs the RICE treatment: Rest, Ice, Compression, and Elevation. These actions help keep swelling at bay and encourage the muscle fibers to repair themselves naturally. A severe strain may lead to a muscle rupture, which is a more serious condition in which the muscle separates entirely from itself or the tendons that connect it to bone. Ruptures often require surgery to fix. The thigh muscle, also known as the rectus femoris, is one of the most commonly strained muscles. It is vital for the proper functioning of the knee, as the thigh muscle can pull up on the knee joint or loosen to allow the knee to release. Pain will occur in the thigh area when a muscle is strained; the intensity of the pain will vary according to the severity of the injury. Many people are able to continue normal functioning of the leg despite the strain in minor instances, but more severe instances may incapacitate the sufferer and prevent him from moving the leg. The calf muscles are other commonly strained muscles. These muscles can strain if they are not properly conditioned for athletic activity, or if they are tight from inactivity. Muscles tend to tighten as they become tired, and weaker muscles will become tired more quickly, increasing the likelihood of a muscle strain. The hamstring is perhaps the most commonly strained muscle. This muscle runs the length of the back part of the femur, or thigh bone. It runs approximately from the buttocks to the top of the back of the knee. These muscles tend to tighten when inactive, commonly leading to muscle strains. Athletes may also experience a hamstring strain during physical activity, as this muscle is responsible for much of the normal movement of the hips and knees. How Do I Treat a Trapezius Strain? How Do I Treat a Strained Foot? What Are the Signs of a Strained Pectoral Muscle? What are the Muscles of the Thigh? How do I Strengthen Paraspinal Muscles? How do I Treat a Strained Knee? How do I Treat a Strained Tendon? When I was taking Japanese jujitsu, we were practicing throws and rolls and I did something to an abdominal muscle. I felt a sort of "scrinch!" and it hurt then, but it was the next morning when I *really* felt it! It was tortuous. I missed a day of work because I simply couldn't get out of bed, or up and down from a chair without my husband pulling me up! It was awful. Needless to say, I was much, much more careful in class when we worked on throws and rolls. I still got sore occasionally, but I didn't strain another ab muscle, thank goodness! That was a bad couple of days. When I was about 15, I had a bicycle wreck, and somehow ended up with a strained groin muscle. Hurt? Oh, my Lord, did it hurt! Fortunately, it happened during the summer and I didn't have to go to school and walk all day. I was able to rest it and let it heal. It wasn't as bad as when I sprained my ankles, but it was bad enough. Sprained ankles are the worst, I think. I hate them. But a strained groin is no fun, either. If you move that one certain way, yeowch! I am completely uninterested in having either a strained groin muscle or a sprained ankle ever again.